Place oil in bottom of stock pot and cook onion until soft. Add broth, water, potato, carrots and tomato. Bring to a boil and reduce to low place lid on and let simmer about an hour and a half. 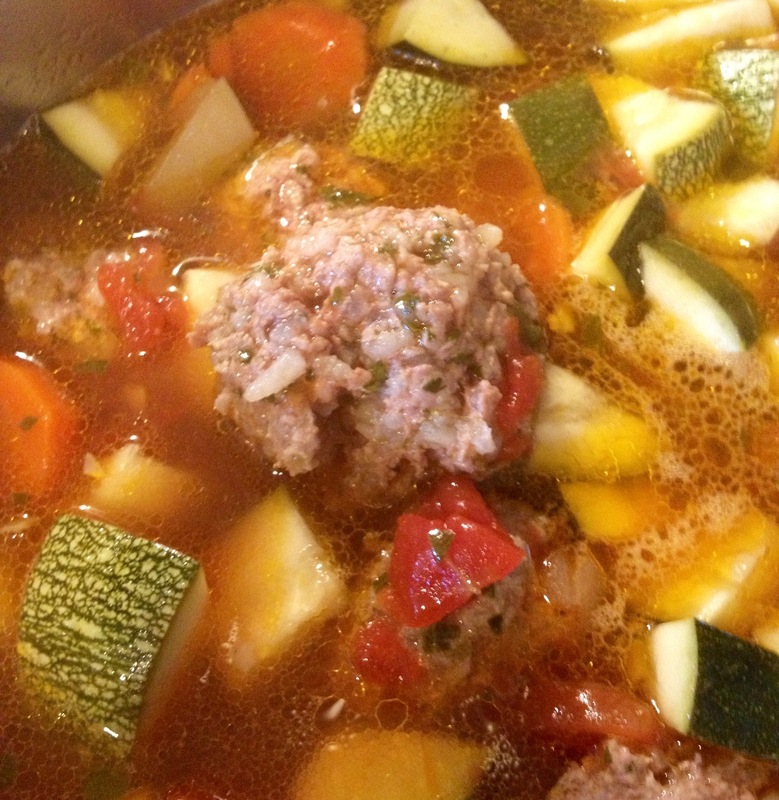 Add meatballs and zucchini and continue to let simmer about an hour and half more. 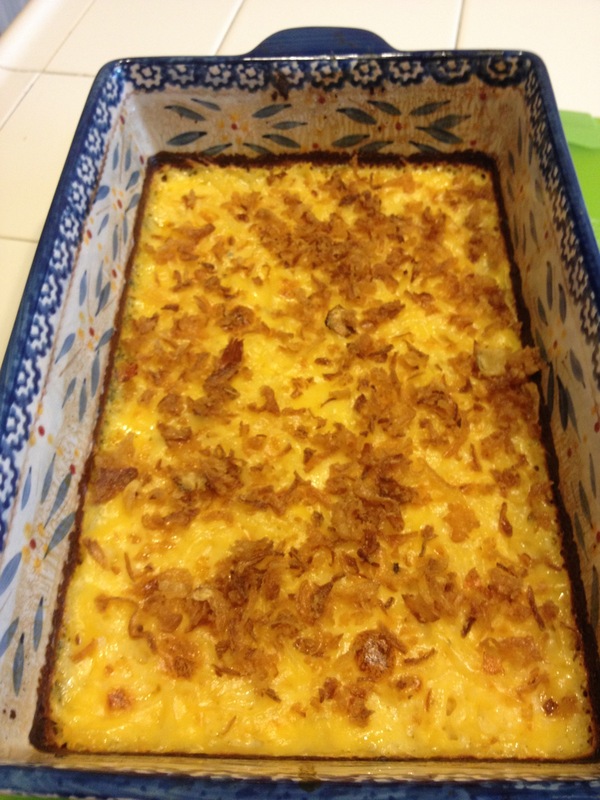 Mix above ingredients and place in a 9×13 baking dish. Bake at 350 degrees for 45 minutes. Remove and sprinkle with 1/4-1/2 cup of French’s French fried onions. Let rest about 5 minutes. Combine water, sugar and kosher salt in bowl of mixer. Sprinkle yeast on top. Let sit about 5 minutes. The mixture will begin to foam. Add flour and butter, with dough hook on mixer, mix on low speed until combined. On medium speed knead until dough is smooth and pulls away from bowl, about 5 minutes. Place dough in a clean, oiled bowl. Cover with dish towel and let sit in a warm place about an hour, till dough doubles in size. Preheat oven to 400 degrees, line cookie sheet with parchment paper and oil the parchment paper. Bring water and baking soda to a boil. 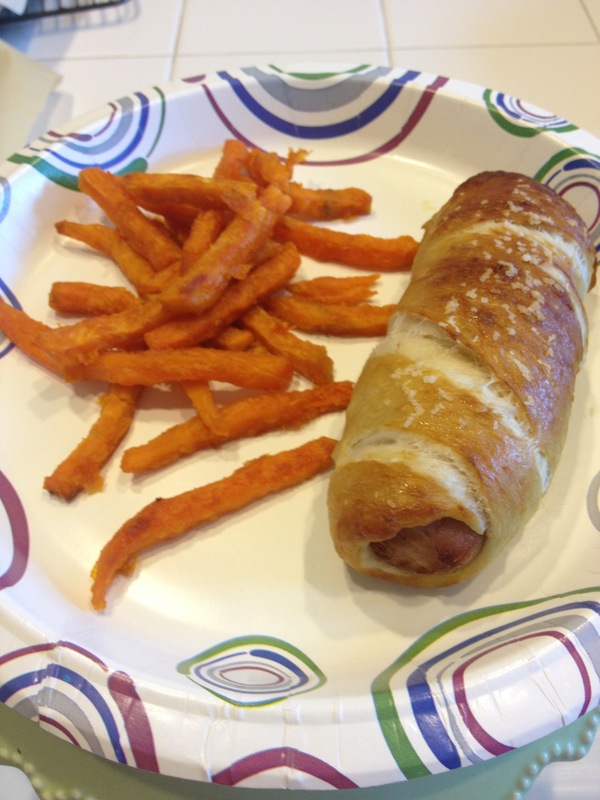 Place the pretzel dogs one at a time sliding off a slotted spoon into boiling water about 30 seconds each and place on prepared cookie sheet. Brush the tops with egg wash and sprinkle with kosher salt. Bake at 400 degrees 12-16 minutes until dark golden brown. Preheat oven to 350 degrees. Line cupcake tins and set aside, this recipe will make 24 cupcakes. Beat with mixer on medium for about 3 minutes. Bake at 350 degrees for 17-20 minutes until toothpick inserted in center comes out clean. 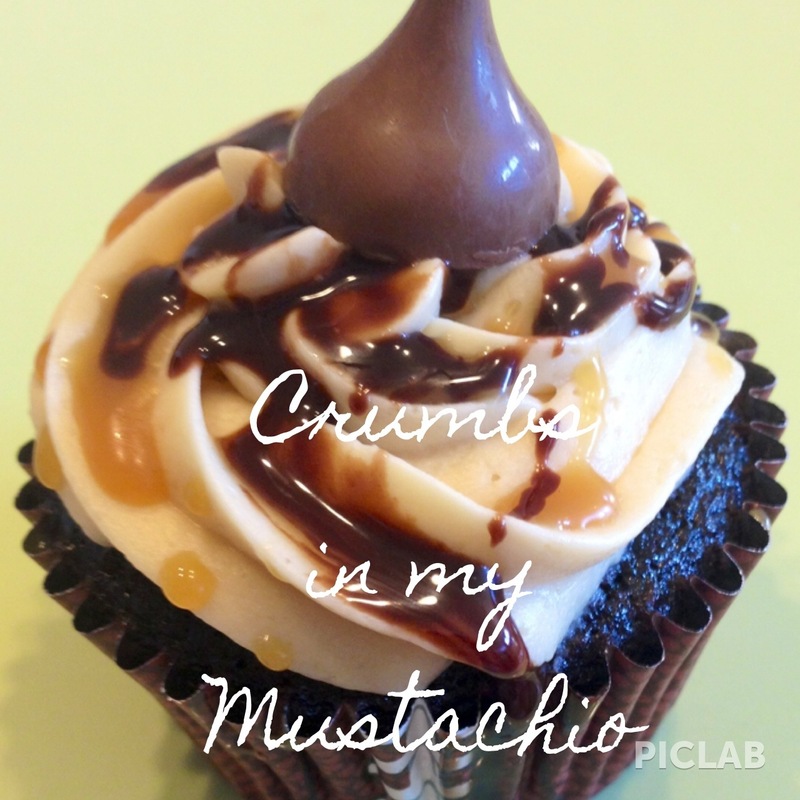 Remove from oven and immediately place 1 caramel Hershey’s kiss into center of each cupcake. Let cool in tins on rack about 10 minutes. Remove from tins and let cool completely. Beat butter and caramel together until creamy and sort of fluffy. Add powdered sugar, vanilla and salt, beat until frosting consistency. Salt, baking soda and spices (sifted together), mix well. 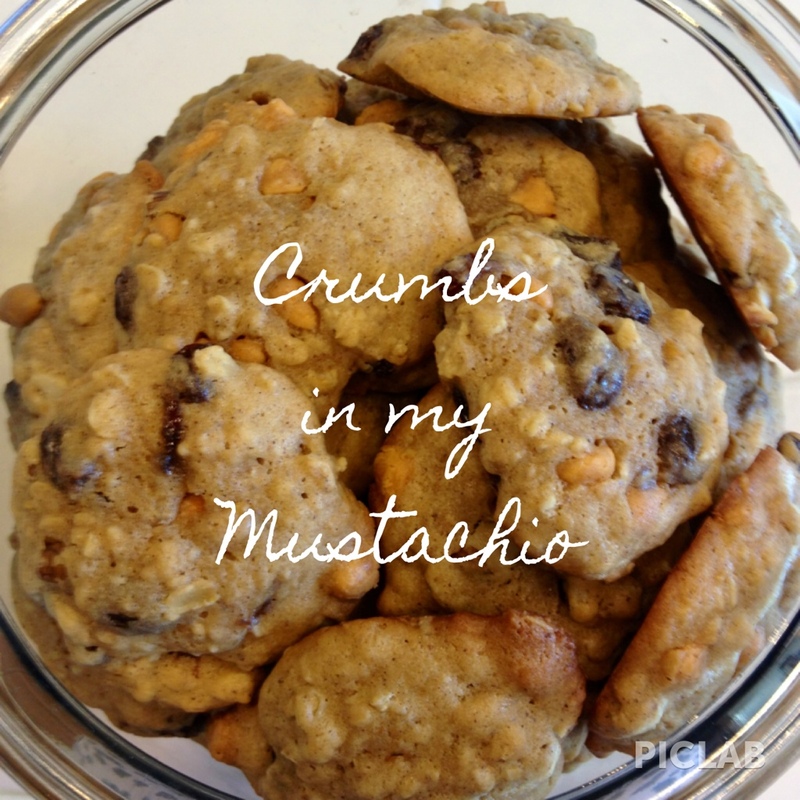 Add oatmeal, raisins, nuts and butterscotch chips and mix. Drop by teaspoon full on cookie sheet. Ungreased and bake until light brown, about 10-15 minutes. Copy Cat Banchero’s Soup recipe…. 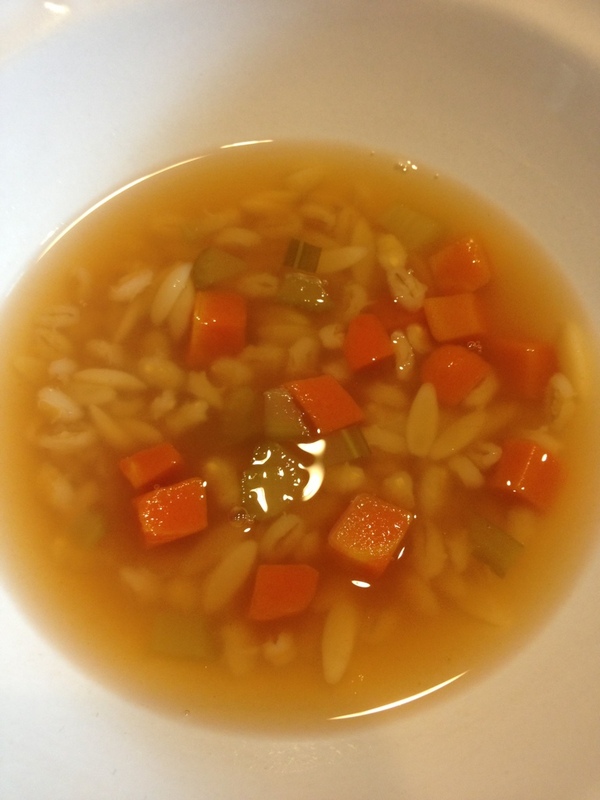 In a large stock pot..
Bring chicken stock to a boil, add veggies and barley. Place lid on and let simmer for about 40 minutes. Add tomato sauce and pastina continue to simmer until pastina is cooked. Cut off tops of peppers, remove seeds and rinse. Bring a large pot of water to boiling add peppers and cook for about 2 minutes. Drain. In a skillet cook beef and onion until browned, drain. Stir in rice, salt garlic and 1 cup of tomato sauce. Cook till hot. 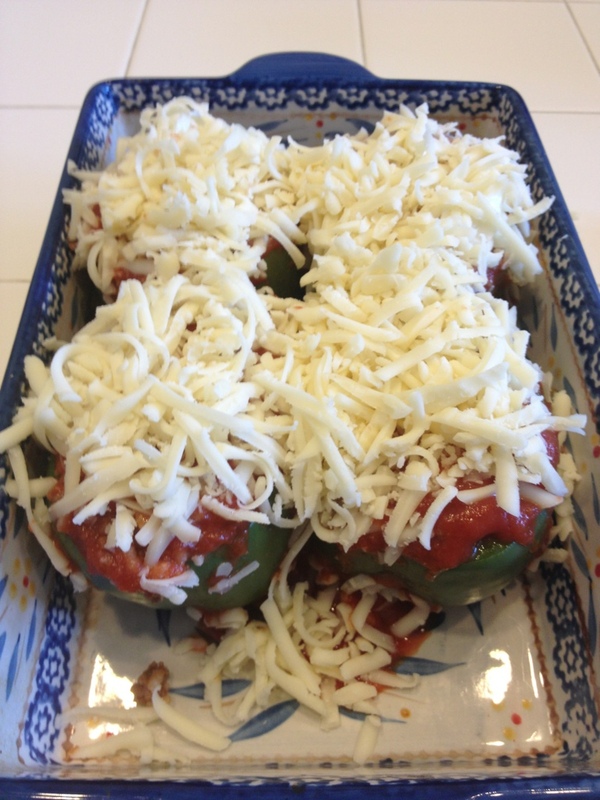 Stuff peppers with beef mixture and stand up in an 8×8 baking dish. Pour remaining tomato sauce over top. Cover in cheese. Tightly wrap foil on top and bake for 10-15 minutes. Remove foil and continue to bake another 20 minutes or so till peppers are tender.